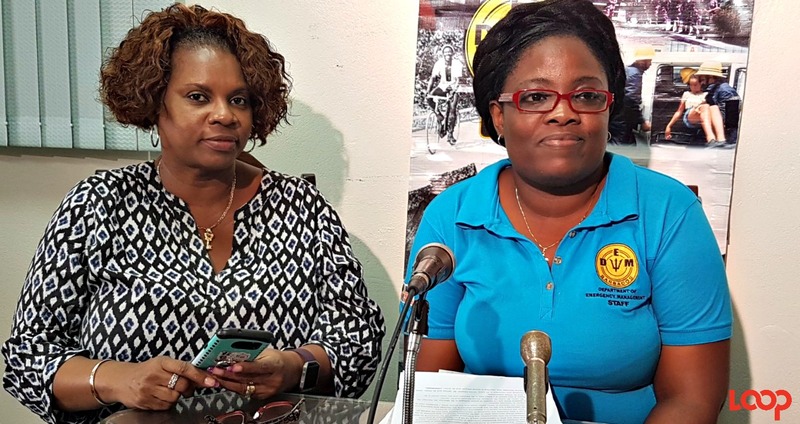 Lynda Holder, acting General Manager of the Transport Board and Director of the DEM, Kerry Hinds. The resumption of business within the public sector and private sector is to be 12:00 pm today. Director of the Department of Emergency Management (DEM), Kerry Hinds said "We are past the worse of it... The eye has passed and most of the convection, but we will still get bursts of wind, gusts and rain." "It has been agreed after consultation with various authorities to resume public service from about 12:00 pm today." In relation to the private sector after consultation with the Barbados Chamber of Commerce and Industry that sector will work with the midday resumption as well. The DEM and emergency services will remain active as they continue conducting assessments. 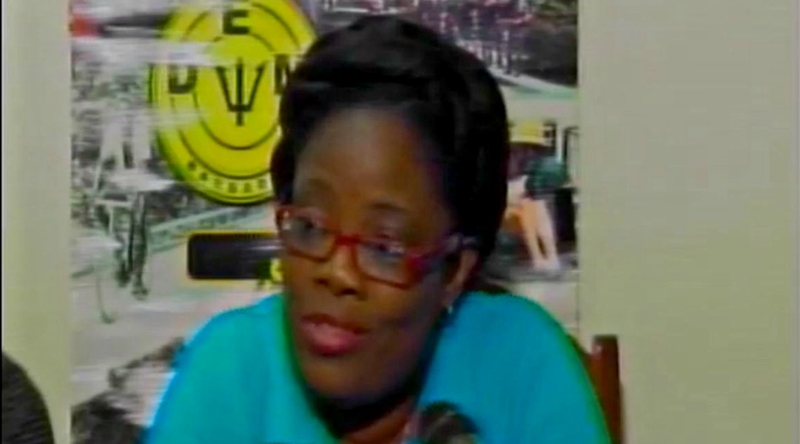 Hinds stressed, "we want no casualties" and urged persons to be cautious and take precautions as they seek to go about their business while damage assessment teams carry out their checks with fallen trees and downed power lines. She urged, "Err on the side of caution." 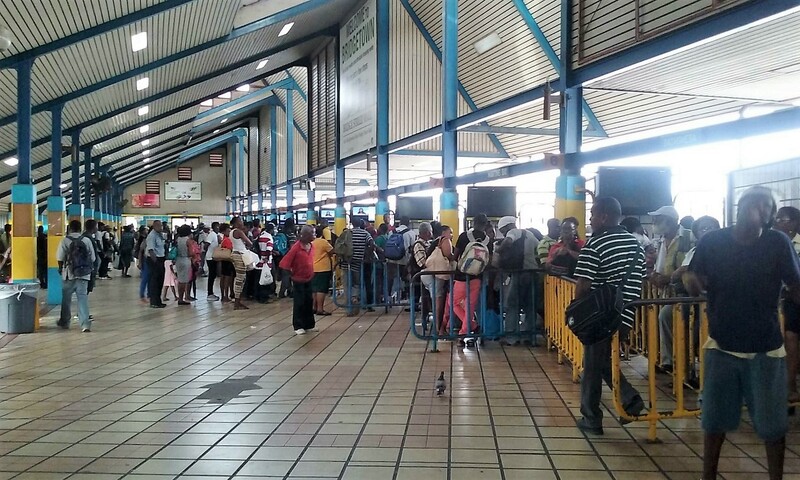 Acting General Manager of the Transport Board, Lynda Holder said that their services will be coming back online to facilitate the midday resumption but she insisted that the services will be staggered. She beseeched, "Do not go to bus stops and complain about a long wait. Bear with us." The Government of Barbados has discontinued the Tropical Storm Warning for Barbados as of 8 a.m. However, the all-clear has not yet been given and the Flood Warning remains in effect until 9:00 a.m. The Small Craft Warning is also still in effect. In its 8 a.m. bulletin, the National Hurricane Center in Miami said the centre of Tropical Storm Harvey was located near latitude 13.0 North, longitude 60.3 West, about 55 miles (90km) west of Barbados. Harvey is moving toward the west near 18 mph (30 km/h), and a continued westward motion with a slight increase in forward speed is expected over the next couple of days. On the forecast track, Harvey should move through the Windward Islands and into the eastern Caribbean Sea this morning. Maximum sustained winds remain near 40 mph (65 km/h) with higher gusts. Some slight strengthening is possible during the next 48 hours. Tropical-storm-force winds extend outward up to 60 miles (95 km) mainly to the north of the center. The minimum central pressure estimated from Air Force Reserve Hurricane Hunter aircraft data is 1005 mb (29.68 inches). A Tropical Storm Warning is in effect for Martinique, St. Lucia, St. Vincent and the Grenadines. Meanwhile, a Tropical Storm Watch is in effect for Dominica. The National Petroleum Corporation (NPC) has advised that its natural gas supply to the country is functioning as normal. The NPC Duty Team has not received any reports of damages or leaks and that its supply pressures from the Barbados National Oil Company are optimal, as well as its distribution pressures to customers. The Technical Teams are currently awaiting the All-Clear from the authorities to go out and inspect the NPC infrastructure. They said they are aware of the extensive flooding in the north of the island and their team will be inspecting all of their infrastructure for damage. If the public wishes to report any leaks they can call the NPC as 430-4000 or 430-4099. Should you suspect you have a leak please turn off the shut-off valve to your home (generally located where the gas line enters the house) and report the leak to the NPC. 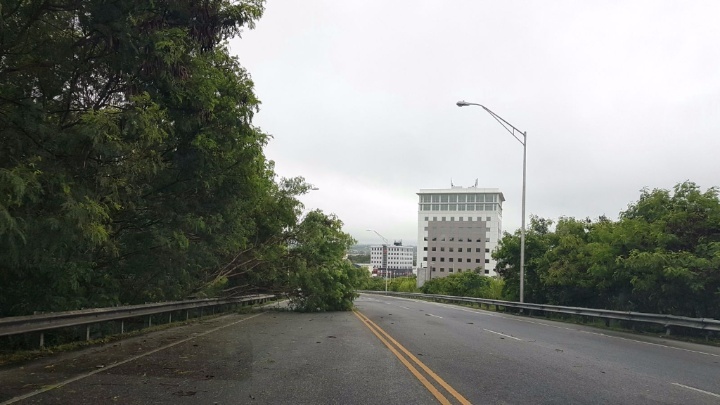 There is a tree obstructing the ABC highway on the section between Hinds Hill and Warrens, heading towards the D'Arcy Scott Roundabout. There have been reports of flooding around Speightstown, St Peter. 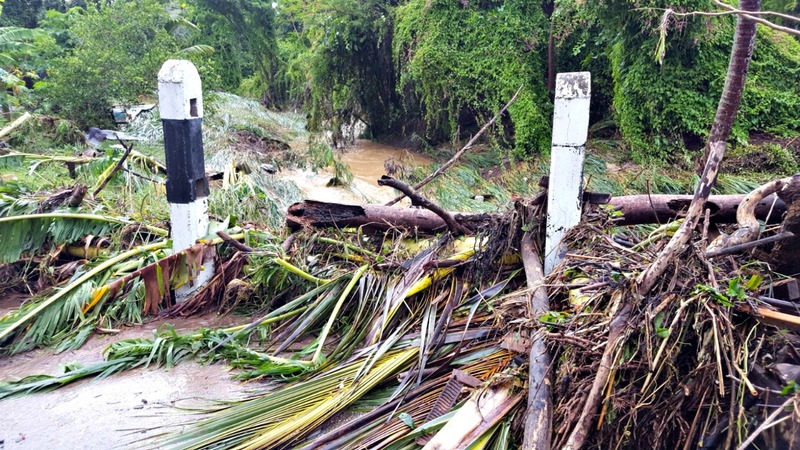 Director of the Department of Emergency Management (DEM), Kerry Hinds, reported that overnight there were a number of power outages across the island, as well as some fallen trees and damaged utility poles. 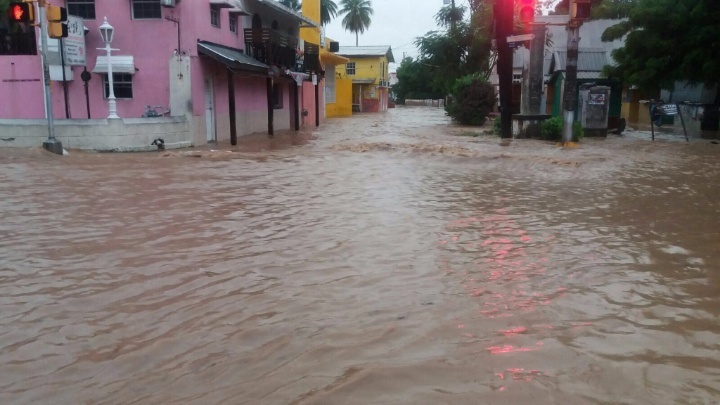 There were reports of flooding, mainly in the northern and west parishes, and so far two persons have sought shelter at Gordon Greenidge Primary. The Barbados Light & Power told Loop News that three feeders were offline briefly last night, causing a loss of power in parts of St Michael, Christ Church and St Philip. There were also a few isolated outages in the north of the island in St Peter and St James. However, in all instances, the BL&P official said power was restored within 20 minutes. The Barbados Meteorological Services (BMS) said in its 5 a.m. bulletin that Barbados remains under Tropical Storm Warning and Flood Warning, as the centre of Tropical Storm Harvey draws nearer to the island. At 5:00 a.m, the centre of TS Harvey was located near 13.1°N, 59.1°W or about 30 miles (45 km) east southeast of Barbados and the system is moving westward at 18mph/ 30 km/h. On its present track, the centre is expected to pass near or over Barbados within the next hour or two. Pockets of moderate to heavy showers and frequent thunderstorms have been affecting the island during the last several hours. However, a decrease in intensity is anticipated as the day progresses. 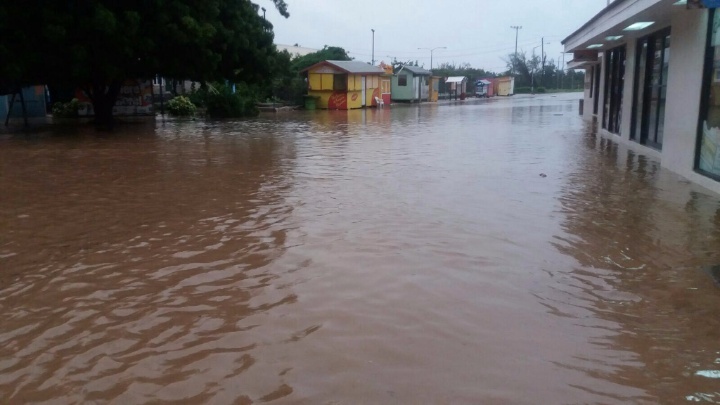 At Charnocks, the BMS observed rainfall accumulations of 113mm (4.5 inches) between 8:00 p.m and 2:00 a.m. Reports from other stations across the island ranged between 50 and 100mm (2 to 4 inches). In addition, easterly swells of at least 2.5 to 3.0m (8 to 10 ft) are accompanying the system. Thus, a Small-Craft Warning remains in effect. Residents are urged to remain on the alert and take all necessary precautions. The National Hurricane Center in Miami has reported that Tropical Storm Harvey is "drenching" the Windward Islands. At 500 a.m., the centre of Tropical Storm Harvey was located near latitude 13.1 North, longitude 59.1 West, which is 45 km east-south-east of Barbados. Harvey is moving toward the west near 18 mph (30 km/h) and on the forecast track, Harvey should move through the Windward Islands and into the eastern Caribbean Sea later today. Maximum sustained winds remain near 40 mph (65 km/h) with higher gusts. Some slight strengthening is possible during the next 48 hours. Tropical-storm-force winds extend outward up to 60 miles (95 km) mainly to the north of the centre. The estimated minimum central pressure is 1004 mb (29.65 inches). The Barbados Meteorological Services (BMS) noted that the centre of Tropical Storm Harvey is still expected to pass Barbados around 8 a.m. The Flood Warning, Tropical Storm Warning and Small Craft Warning remain in effect for Barbados. Pockets of moderate to heavy showers and frequent thunderstorms are affecting the island and will continue to do so during the early part of today. Some rainfall stations across the island have already observed accumulations of 25 to 50mm (1 to 2 inches) and a further 50 to 75 millimeters (2 to 3 inches) are possible. In addition, large easterly swells of at least 2.5 to 3.0m (8 to 10 ft) are also forecasted to accompany the system. The next bulletin is expected at 5 a.m. The 2 a.m. update from the Miami-based National Hurricane Center indicated that the centre of Tropical Storm Harvey was located near latitude 13.0 North, longitude 58.1 West - about 95 miles (155 km) east of Barbados. Harvey is moving toward the west near 17 mph (28 km/h), slowing down ever so slightly from the 18 mph (30 km/h) reported in the 11 p.m. bulletin. However, maximum sustained winds remain near 40 mph (65 km/h) with higher gusts. Slow strengthening is possible during the next 48 hours. Tropical-storm-force winds extend outward up to 60 miles (95 km) mainly to the north of the centre. Overall, the NHC says weather conditions are deteriorating in the Windward Islands as TS Harvey approaches. 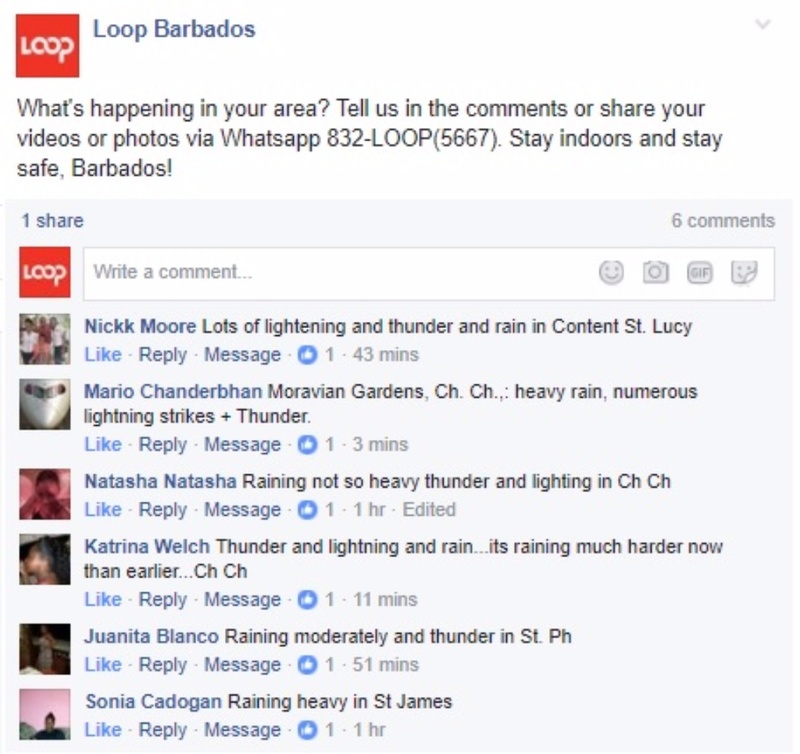 Residents from various parts of the island are reporting moderate to heavy rainfall, as well as lots of lightning and thunder. Here's a look at conditions in Husbands, St James, just outside the Category 1 Shelter, Queen's College. A Flood Warning is in effect for Barbados until 12 noon on August 18, 2017. This is according to the Barbados Meteorology Services (BMS) in its 11 p.m. bulletin on Tropical Storm Harvey. The weather system has been generating cloudy to overcast skies, moderate to heavy showers, periods of rain and scattered thunderstorms across Barbados during the last few hours. These conditions along with occasional gusty winds are expected to persist into early tomorrow. Some flash-flooding has already been reported. Thus, a Flood Warning has been issued and will remain in effect until 12:00 noon tomorrow, Friday, August 18, 2017. A Flood Warning means that some flooding is already occurring or is likely to occur. Rainfall accumulations of at least 75-125 mm (3-5 inches) are possible. Residents in flood prone areas should continue to exercise caution and remain on the alert. This Warning will be updated if conditions warrant. 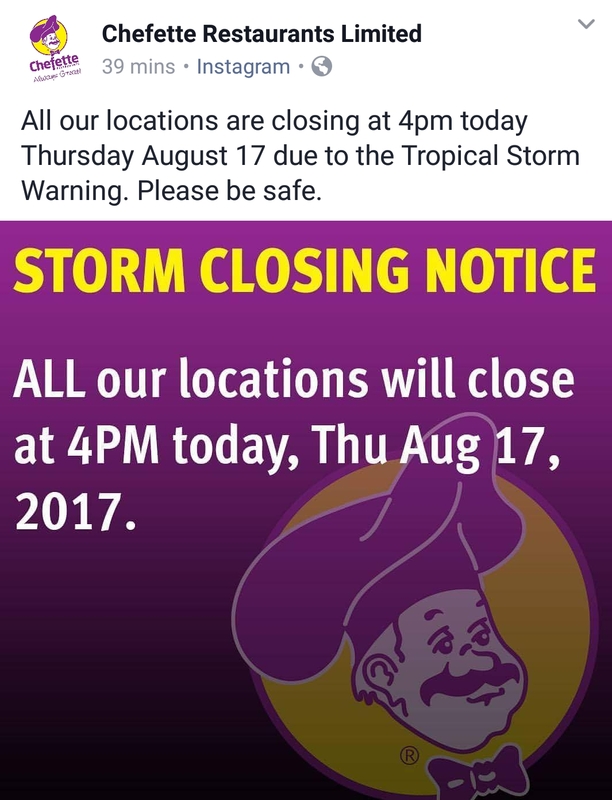 Barbados remains under Tropical Storm Warning. In its 11 p.m. advisory, the National Hurricane Center in Miami said Tropical Storm Harvey is located at 13.0N 57.4W, about 140 miles (230 km) east of Barbados. Tropical Storm Harvey is moving toward the west near 18 mph (30 km/h), and a continued westward motion with a slight increase in forward speed is expected over the next couple of days. Maximum sustained winds are near 40 mph (65 km/h) with higher gusts. Slow strengthening is possible during the next 48 hours. Tropical-storm-force winds extend outward up to 60 miles (95 km) from the centre. The National Emergency Operation Centre (NEOC) was activated around 6:30 p.m. with representatives from a number of emergency services and essential agencies, including the Royal Barbados Police Force, Barbados Defence Force, Ministry of Transport & Works, Transport Board, Ministry of Education, ports of entry, Ministry of Health and the ambulance services. Director of the Department of Emergency Management (DEM), Kerry Hinds, says there have been no reports of damages thus far and has asked the public to report any damage to the NEOC at 438-7575 or via any of the 24-hour emergency numbers (e.g. Police, Fire Service). She reminded residents living in low-lying areas to be extra cautious since the Met Office has advised that TS Harvey is set to generate quite a bit of rainfall. Director of the Department of Emergency Management (DEM), Kerry Hinds, speaking at the National Emergency Operation Centre tonight. Gordon Greenidge Primary is not available at this time. As it relates to the Transport Board, there will be no service until the all-clear given. In its 8 p.m. bulletin, the Barbados Meteorological Services (BMS) noted that Barbados remains under a Tropical Storm Warning. A Tropical Storm Warning means that sustained winds of 34 to 63 knots (39 to 73 mph/ 63 to 118 km/h) are expected somewhere within the specified area in this case within the next 12 to 18 hours. On its present track, the center is expected to pass near or over Barbados at approximately 8:00 a.m. Friday morning. Deteriorating conditions with pockets of moderate to heavy showers, thunderstorms and gusty winds are expected to spread across Barbados later tonight and into tomorrow. Rainfall accumulations of 3 to 5 inches (75 to 125 millimeters) and possible isolated higher amounts are forecast. In addition, large easterly swells of at least 2.5 to 3.0m (8 to 10 ft) are also forecasted to accompany the system. Thus, a Small-Craft Warning is in effect. Some flooding is likely in low-lying areas and residents are urged to be on the alert and take all necessary precautions. The next bulletin from the BMS will be issued at 11 p.m. The Miami-based National Hurricane Center notes that at 8:00 pm, the centre of Tropical Storm Harvey was located near latitude 12.9 North, longitude 56.5 West, which is about 205 miles (325 km) east of Barbados. Harvey is moving toward the west near 18 mph (30 km/h), and this motion is expected to continue for the next couple of days. Harvey is expected to produce rainfall totals of 2 to 4 inches across portions of the Windward Islands from Martinique southward to Grenada. These rains could cause life-threatening flash floods and mudslides. On the forecast track, Harvey should move through the Windward Islands and into the eastern Caribbean Sea on Friday. Reports from an Air Force Reserve Hurricane Hunter Aircraft indicate that maximum sustained winds are near 40 mph (65 km/h) with higher gusts. Slow strengthening is possible during the next 48 hours. Tropical-storm-force winds extend outward up to 35 miles (55 km) to the north of the centre. 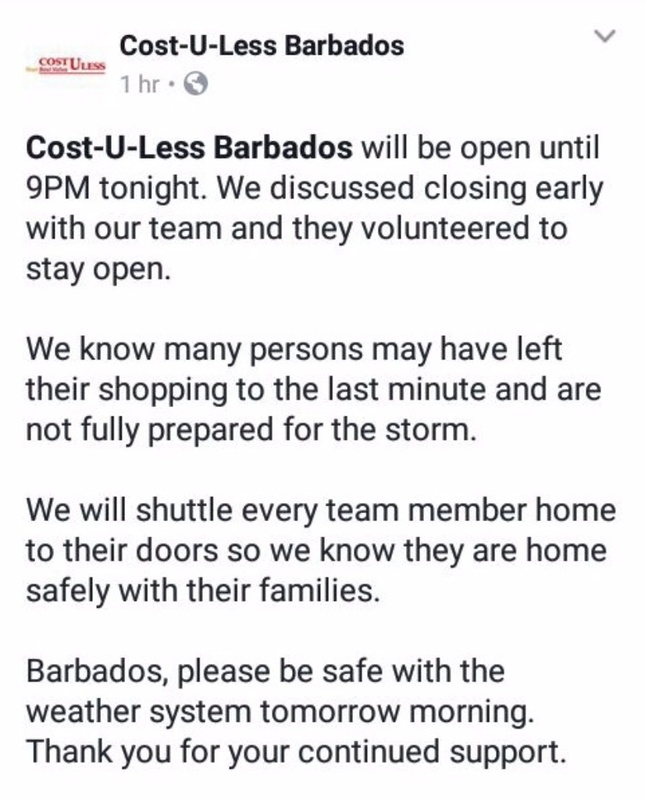 As Barbadians brace for the passage of Tropical Storm Harvey, at this hour few retail establishments remain open. 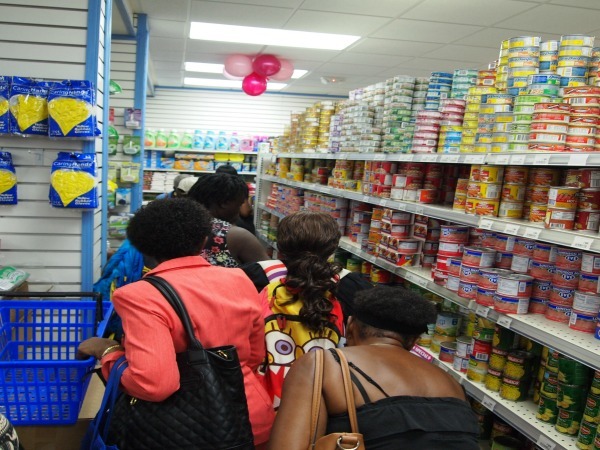 Among them are Sol Wildey, which had long lines of cars, as well as Cost-U-Less in Welches, St. Thomas, which announced via its Facebook page that it would remain open until 9 p.m. to accommodate last-minute shoppers. "We discussed closing early with our team and they volunteered to stay open. "We known many persons may have left their shopping to the last minute and are not fully prepared for the storm. "We will shuttle every team member home to their doors so we know they are home safely with their families." The Barbados Meteorological Services has advised that at 5:00 p.m, the center of Tropical Storm Harvey was located near 13.0°N, 55.8°W or about 250 miles (400 km) east of Barbados. The system is moving westward at 18 mph/ 30 km/h and on this track, the centre is expected to pass near or over Barbados early (approx. 8:00 a.m.) Friday morning. Maximum sustained winds remain near 40 mph (65km/h) with higher gusts. Minimum central pressure of 1004mb (29.65 inches). In addition, large easterly swells of at least 2.5 to 3.0m (8 to 10 ft) are also forecasted to accompany the system. Thus, a Small-Craft Warning is in effect from 6:00 p.m today, Thursday, August 17, 2017. Some flooding is likely in low-lying areas. Residents are therefore urged to be on the alert and take all necessary precautions. The next bulletin is expected at 8 p.m.
LIAT advised earlier this afternoon that six flights into and out of the Grantley Adams International Airport have been cancelled, while the departure time for one flight has been changed. 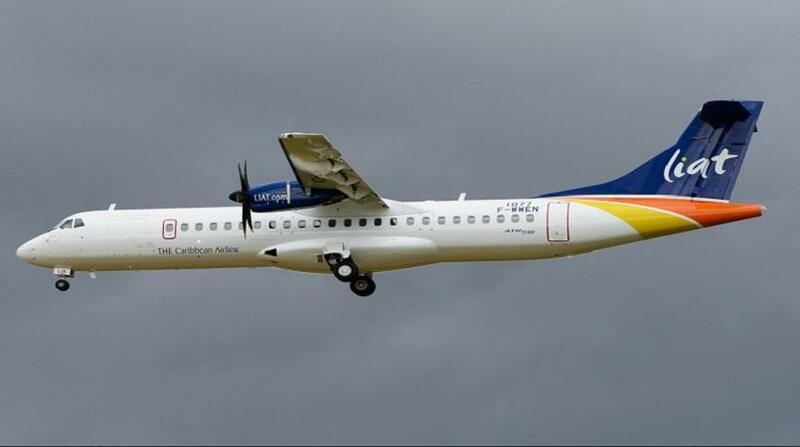 LI 393 has been rescheduled to depart Barbados at 6:00 p.m. The National Hurricane Center in Miami has said in its 5 p.m. bulletin that the weather disturbance has become Tropical Storm Harvey. At 500 p.m, the centre of Tropical Storm Harvey was located near latitude 13.0 North, longitude 55.8 West. Harvey is moving toward the west near 18 mph (30 km/h), and this motion is expected to continue for the next couple of days. Meanwhile, the Barbados Meteorological Services says it is currently monitoring live reports from the reconnaissance aircraft and is currently preparing an updated bulletin. 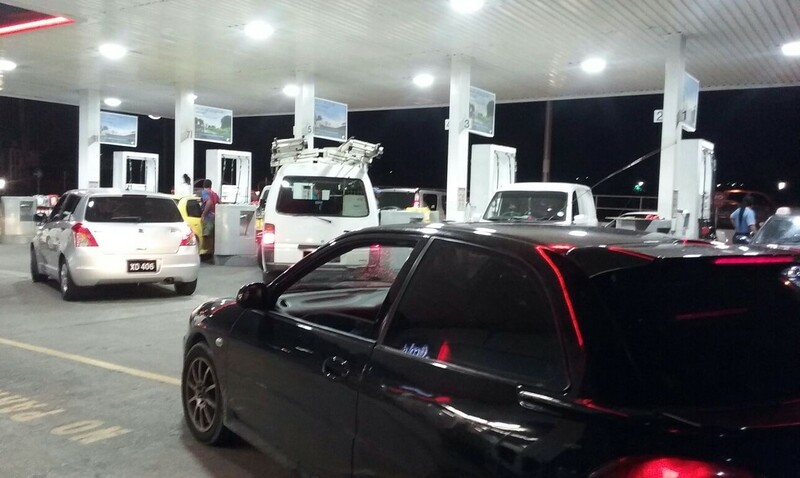 Heavy traffic is being reported around the island, with long queues at gas stations and supermarkets, as residents make last-minute preparations and make their way home. Many commuters were waiting at the Fairchild Street Bus Terminal for the final buses which are set to leave at 5 p.m. Terminal guards have indicated that no commuters will be allowed inside the terminal after the 5 p.m. shutdown. Rains associated with this system are expected around 8 p.m. tonight and some three inches of rainfall are possible between the next 12 to 16 hours. More rain than wind is expected with this system. Flooding and flash flooding may occur and residents are being asked to stay indoors once they reach their home. They are advised not to venture outside until the all-clear is given - which will likely be tomorrow morning. A number of private sector business are now closed to allow staff to make their way home. The Barbados Meteorological Services said in a 3 p.m. bulletin that deteriorating conditions with pockets of moderate to heavy showers, thunderstorms and gusty winds are expected to spread across Barbados from tonight and into tomorrow. Thus, a Small-Craft Warning will be in effect from 6:00 p.m today, Thursday, August 17. Some flooding is likely in low-lying areas. Thus, residents are urged to be on the alert and take all necessary precautions. The next update from the Barbados Meteorological Services will be at 5 p.m.
Government offices will close from as early as 2:30 p.m. today, Thursday, August 17, as Barbados remains under tropical storm warning as Potential Tropical Cyclone #9 approaches the island. In addition, the Transport Board has advised that the last bus for today will leave the terminals at 5:00 p.m. 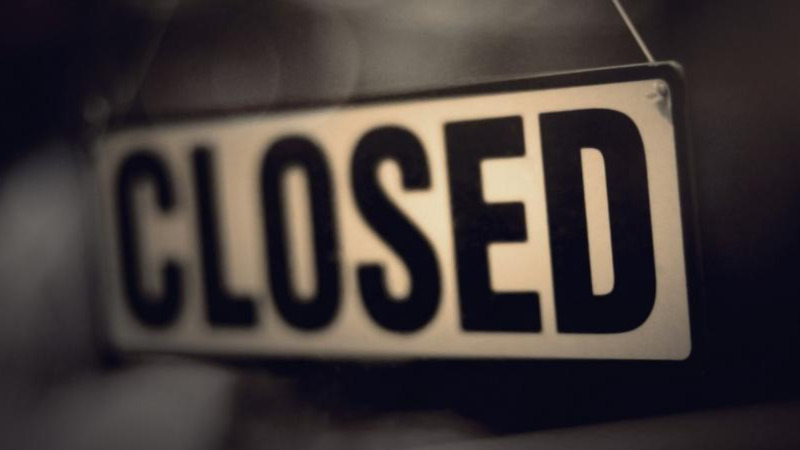 The Barbados Chamber of Commerce and Industry has also recommended that private sector entities employ a staggered shutdown approach with offices closing at 2:30 p.m.; retail stores at 3:30 p.m. and gas stations and supermarkets and other essentials by 4:30 p.m. These recommendations follow detailed discussions with stakeholders in the National Emergency Operations Centre in light of the approach of the system. The Miami-based National Hurricane Centre (NHC) has advised in a 2 p.m. bulletin that a Hurricane Hunter aircraft is en route to investigate the disturbance. The disturbance was centered near latitude 13.1 North, longitude 55.1 West - about 295 miles (475 KM) east of Barbados. The system is moving toward the west near 17 mph (28 km/h) and this motion is expected to continue for the next couple of days. On the forecast track, the disturbance should move through the Windward Islands and into the eastern Caribbean Sea on Friday. The disturbance is expected to become a tropical cyclone later today or tonight, and it could become a tropical storm before reaching the Windward Islands. Satellite imagery indicates the disturbance is close to becoming a tropical cyclone. An Air Force Reserve Hurricane Hunter Aircraft is currently en route to investigate the system. According to the NHC, formation chance through 48 hours is high - near 100 percent. A Tropical Storm Warning is in effect for Barbados, Martinique, St. Lucia, St. Vincent and the Grenadines, while a Tropical Storm Watch is in effect for Dominica. A Tropical Storm Warning means that tropical storm conditions are expected somewhere within the warning area, in this case within 24-36 hours. A Tropical Storm Watch means that tropical storm conditions are possible within the watch area, in this case within 24-36 hours. The Barbados Meteorological Services says its next update on Potential Tropical Cylone #9 will be at 3 p.m.
A Tropical Storm Warning is in effect for Barbados and the Disaster Emergency Management (DEM) are meeting urgently with stakeholders and the Met Office. At 11:00 am. the potential Tropical Cyclone Nine was near 13.1N, 54.1W. “The area of low pressure east of Barbados has been upgraded to Potential Tropical Cyclone #9. The National Hurricane Center now has the option to issue advisories on disturbances that are not yet tropical cyclones but which pose the threat of bringing tropical storm or hurricane conditions to land areas within 48 hours. The Met Office also indicated that deteriorating conditions with pockets of moderate to heavy showers, thunderstorms and gusty winds are expected to spread across Barbados from tonight and into tomorrow. In addition, large easterly swells of at least 2.5 to 3.0m (8 to 10 ft) are also forecast to accompany the system. Thus, the Small-Craft Warning continues to be in effect from 6:00 p.m today, Thursday, August 17, 2017. Some flooding is likely in low-lying areas. Thus, residents are urged to be on the alert and take all necessary precautions. The Met Office promised to update information at 2:00 pm. WATTS NEW: Are you storm ready?